Laundering to make their activities authorised. Because the Money which is generated by the illegal way is dangerous and can not be used directly so to make it happen Money Laundering is the process of conversation of such illegal activities to make it appear like authorised or legal. Simply it is the process of engaging in specific Financial transactions to hide the identity, Process source and destination of money. The process of Money Laundering contains following stages. The person who has the Money which is generated by illegal or fraud activities introduces such unauthorised funds into the Financial System by depositing smaller number of amounts in the Bank by using cheques or another instrument. In this stage the main work of the money launderer is the entry of his fund. Now the second stage of Money Laundering is the layering. In this stage, the Money Launderer finds the unique way for transaction by creation of complex network In which he uses lots of different account so as to hide his true origin.He uses another person's account to place his money safe. After successful placing of his criminal money through first two stages then money launderer uses such funds in the business, real estate, and in some other assets.Also then authorized money transferred or returned to the source where it has been originated. The above stages always not work line by line sometimes illegal money gets mixed with authorized money like in the business of gambling nobody knows the source of money but after the gambling it becomes authorized for that individual. In India, the Anti Money Laundering measures are controlled by using the Prevention of Money Laundering Act, 2002 which was introduced got working from 1st July 2005. RBI, SEBI and IRDA have introduced it under the PML Act, and hence it will be now applicable to all financial institutions, banks, mutual funds, insurance companies, and other financial agencies.The agency which is responsible for monitoring the Anti Money Laundering activities in India is called Financial Intelligence Unit (FIU IND) .It works under Department of Revenue, Ministry of Finance which analyses all the information related to person who is suspect. International Convention for the Suppression of the Financing of Terrorism (1999). UN Convention against Corruption (2003). 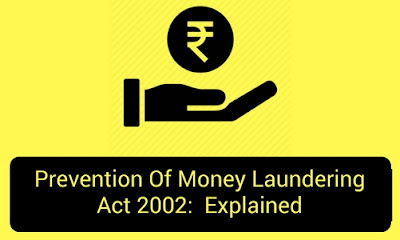 Under the special session held by United Nations General Assembly (UNGASS) during 8th to 10th June 1998 all the members of this group have to adopt the Anti Money Laundering Legislation & Programme and for that they have made act called 'Prevention Of Money Laundering Act 2002'. This Act has been again amended for enlarging its scope of money laundering, in 2009 by the law of Prevention of Money Laundering (Amendment) Act 2009. This Act was again further amended by Prevention of Money-Laundering (Amendment) Act 2012. Financial Action Task Force (FATF) is a government body which is established and introduced in 1989 by the initiative of G7 group. The main objectives of FATF are to regulate the effective implementation for fighting against money laundering, terrorist Financial activities and other problems related to the international financial system. Freezing terrorist assets , establishing Financial intelligence unit for collection , evaluation and find suspicious transactions reports from Financial institution are the functions of FATF. Indian is one of the active member of this FATF group. Offence of money laundering has been defined in the section 3 of the Prevention Of Money laundering Act. Any person who is directly or indirectly attempts to become the part of the such illigal activity shall be guilty according to the offence of money laundering. Under the section 17 and section 18 of Money laundering Act freezing of all unauthorised property and records takes place. Persons who committed this crime and found responsible according to offence of money are punishable to put in the prison for three years which may be extended upto seven years and also that person have to pay fine under the section 4 of money laundering act. If the offence committed is under the Narcotics and Psychotropic Substance Act 1985 then in that case the guilty person gets three years of prison which can be extended upto ten years and also that person have to pay fine. After all this prevention and lots of rules and regulations by Government there are some people who are not stopping and that's why India is listed among the six countries which are actively monitored by the INTERPOL and other International banking agencies.